Ann Cafferty is a member of the Hilton Head Orchestra, and performs regularly with both the Charleston and Augusta Symphonies. She was Assistant Concertmaster of the Savannah Symphony, where she performed for 15 years. Prior to this, she was a member of the Oklahoma Symphony and the Tulsa Philharmonic. She was also the Assistant Concertmaster of the Chamber Orchestra of Oklahoma City, and performed as a fellowship recipient at the Aspen Music Festival. She played for many summers with the New Hampshire Music Festival and also with the Crested Butte Music Festival. 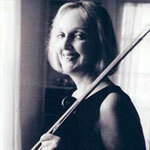 In 1997, Ann was the acting Concertmaster of the Hilton Head Chamber Orchestra. Ann attended Boston University, received a B.F.A. from the State University of New York at Purchase, and earned a Masters degree in performance from the University of Tulsa. She currently has a class of private students in Savannah. Ann can play solo, stroll, and play Violin in a Duet with Piano.